In the wake of the Parkland mass shooting, the National Rifle Association has been facing more backlash than ever for its support of AR-15s. But even in face of public outcries, the gun rights group just proved that it remains staunch in its defense of the right to own semi-automatic weapons: The NRA is now attempting to justify the sale of AR-15s by developing genetically modified deer that can only be hunted with assault rifles. There’s no question about it—the NRA is not backing down. 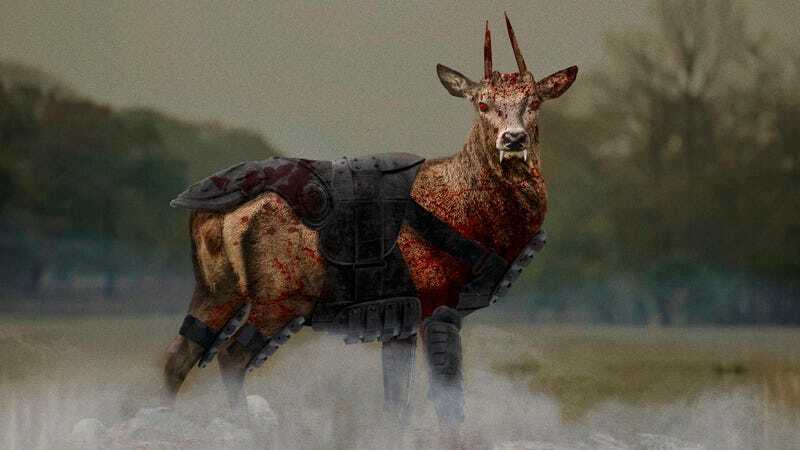 According to figures released this morning, the NRA has invested more than $150 million to alter common deer into terrifying behemoths with titanium fangs and hides thicker than Kevlar in order to rationalize why Americans need AR-15s. When the forests are being stalked by these 7-foot-tall mutants with legs powerful enough to ram through bank vault doors, the NRA is betting that even gun control advocates will concede that everyone will need a gun that can shoot up to 400 rounds per minute to try and slow these unholy abominations down. “Anyone still trying to ban the AR-15 is basically begging to have their face melted off by the mutant deers’ venom saliva spray,” Loesch added. Wow. Because of the ferocious deer mutants soon to be roaming the countryside, recreational hunting could now warrant using weapons that were originally intended only for a battlefield. It looks like the NRA isn’t letting up on the fight for gun rights anytime soon.